Announcing the Outer Space on Film Blogathon! Time for a new blogathon! This time, I am inviting you to write about films that take place in outer space. Space operas, space fantasies, space parodies, space horror stories, animated films set in space–any and all of these are welcome! At least one character in the film MUST leave Earth’s gravitational pull at some point. So it’s O.K. if much of the film is earth bound, as long as at least one character is not during the film. Of course, it’s also O.K. if the character(s) were never on Earth in the first place, i.e. in a galaxy far, far away. Any film from any era, any country is eligible. Shorts (including animated shorts) are welcome, too! 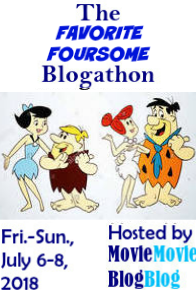 The blogathon will run Friday, April 13 – Sunday, April 15. You may post any day (or earlier, if you wish). Would “The Day the Earth Stood Still” fit your criteria? If so, I’m in! This sounds awesome! Does Alien (the first movie) work for this? It sure does! Welcome to the blogathon! Am looking forward to seeing my review and those of others. Awesome! Thank you! Now off to write this in my calendar! You got it! Thanks for participating! You got it! Thanks for joining in! I’d like to do Flash Gordon (1980)! This will be fun. Sign me up for Abbott and Costello Go to Mars! Great choice! Thanks for joining! Great banners, Debbie! As soon as I saw the one with Bugs Bunny and Marvin the Martian, I immediately wanted that one. Can you put me down for “Haredevil Hare” (1948)? Absolutely! Thanks for joining in! Thanks Debbie, got your tweet early this am hence the muddle – Passengers it is!!! Forbidden Planet is all yours! Thanks for participating! How about… Santa Claus Conquers the Martians – and a little about other filsm set on Mars? Sounds like a fun topic! Thanks for joining! I would love to review the flash Gordon serials. You sure can! Thanks for joining in! Could I write about Alphaville? My blog is Cinematic Scribblings: https://cinematicscribblings.wordpress.com/ Thank you! Hi there! I’d like to join in with “The ‘?’ Motorist” (1906), the most sci-fi fun you can fit into two minutes! Sounds awesome! Thanks for participating! I am SO on board with this one. I even have a title ” The Solar System on $5 a Day”. I will take some of the cheapest drive-in fare I can find. Two to start out, but I may add more: “The Angry Red Planet” (Mars) from 1959 and “Journey to the Seventh Planet” (Uranus) from 1962. I may add another one or two, if after searching my collection I find more that fit. Awesome! I’ll update the roster tonight. Hi, Debbie–what a great idea! I’d like to do “Apollo 13”, please. Hi there! If it hasn’t already been spoken for, I’d like to do First Men in the Moon (1964). It’s all yours! Thanks for joining in! Fantastic! Can I claim Thomas Edison’s A Trip to Mars (1910)? You certainly can! Thanks for joining! That’s great! Thanks for joining in! How did I miss this…was just wondering when you were having another Blogathon. Ok…so…let me do The Fifth Element. Is that ok? I don’t want to hold on to topics so others can’t do them but if nobody claims “Interstellar” I might switch The Fifth Element with that…. No problem! If someone else asks for The Fifth Element, I will let you know. Hi there! Can I do RIDERS TO THE STARS (1954)– thanks!! Pingback: Random Film of the Week: ALIEN³ | "DESTROY ALL FANBOYS!" You bet! Thanks so much for participating! hey deb can i do The martian (2015), planet of the apes (2001) and close encounters (1977)? You got it! Will update the roster later today. Pingback: Random Film of the Week: Alien Resurrection | "DESTROY ALL FANBOYS!" Hi, I’m so sorry, someone has already claimed that film. If you have another post about a space-themed film that hasn’t already been chosen, I would be happy to link to it for the blogathon. Pingback: Random Film of the Week: Hard to be a God | "DESTROY ALL FANBOYS!"